Just had to post this. Our new mayor in Philadelphia. The honarable Michael Nutter. I was stumbling around the web and found this. The LaCie USB and FireWire Hub that I would actually put on my desk. It’s not only a hub — it has a little fan and an led light for those dim conditions or if you only use task lighting like I do. Designed by Ora-Ïto it is a pleasant surprise in the world of ugly boxes that usually perform these functions. I’m a political junkie. 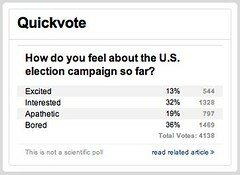 But I can tell you that this time around I’m with the 36% at cnn’s poll. I just can’t get charged up about anyone. Do I think any of the contenders will end these wars? Not a chance. What about the economy? It’s the war stupid. Until we end these wars we will continue to suffer a painful decline. I’m already bored and unimpressed. Ok. I love Bucky. This stamp however is disturbing. The dome head I’m ok with, the giant head not really. This is one of those unpredictable moments that lead me to think about the giant ice cream cones, elephants, and other strangely shaped buildings one can find along what were once the big highways. I imagined driving along the highway at 2 am and seeing Bucky’s head on the side of the road. What, I thought could be inside? A comfortable little hotel? A 24 hour diner? An open all night Bucky museum? After all of these unpredictable thoughts I was lead past my moment of indecision. 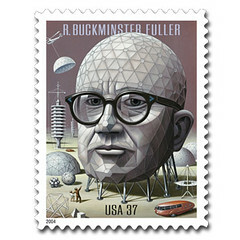 I really don’t like Bucky’s head with no body on this stamp. I just couldn’t buy it. Would you?